There is perhaps no situation that is more frustrating for couples than infertility issues. When those in a loving relationship decide to pursue their dreams of conceiving, they expect to be successful within a few short months - and it can be devastating when this does not happen. As the months drag on, the anticipation and excitement over the possibility of achieving pregnancy turns to anxiety and alarm. While these feelings are certainly natural, they don't improve fertility; in fact, they can actually harm it. Patients that are experiencing difficulty conceiving can take steps to increase fertility, reduce stress, and regain hope. At Mosher Health, we will diagnose the source of your infertility and formulate a natural treatment plan to produce ideal conditions for achieving and maintaining pregnancy. For our patients in San Diego, functional medicine can improve male and female fertility through the use of acupuncture, Chinese herbs, supplements, and dietary modifications. There are a number of problems that can cause female factor infertility or recurrent miscarriage. Irregular menstrual cycles, endometriosis, polycystic ovarian syndrome, and thyroid issues are just a few. By stimulating and balancing the flow of Qi through the placement of fine needles into specific acupoints, Dr. Bret Mosher restores optimal health and can increase your chances of getting pregnant. Before beginning your treatment, Dr. Mosher will ask you about symptoms that occur before your period begins, and the quality and quantity of the menses. We also use the AcuGraph® digital meridian imaging system, which maps out the meridians, or channels, through which the Qi flows. Digital probes are used to measure the amount of energy moving through each meridian. This aids Dr. Mosher in identifying the points where the flow of Qi is inhibited. To promote a sufficient flow of energy through these meridians, Dr. Mosher will access specific acupoints with fine needles. There are more than 1,000 acupoints in the body, and your treatment will be tailored to your individual needs based on your specific diagnosis. When Is the Best Time to Do Acupuncture? Women that are trying to get pregnant should undergo acupuncture once a week for at least three months so we can regulate the cycle and improve fertility. After this time, our San Diego acupuncture patients may want to continue treatment for the stress relieving benefits. 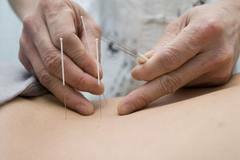 A great deal of research has shown that acupuncture is effective during IVF treatment. Patients undergoing IVF should have acupuncture done immediately before and after the embryo transfer. Once women get pregnant, they may want to continue to undergo acupuncture for the first three months to reduce the risk of miscarriage. It is important that patients choose an acupuncturist experienced in infertility care, as certain acupoints should not be used during pregnancy. Contact Mosher Health today to schedule your acupuncture appointment with us.